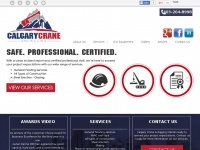 Calgary Crane Service Ltd. is based in Calgary Alberta, and also licensed to operate in British Columbia and Saskatchewan as well. We have been in business since 1996. We specialize in structural steel erecting and all aspects of the construction and oil and gas industry. Our equipment ranges from a variety of boom trucks to mobile cranes. Our goal is to offer quality and exceptional customer service to meet all our customer's needs. three profiles were found for Calgarycraneandrigging.ca in social networks. Among other social networks the website is represented in Facebook, GooglePlus and LinkedIn. The web server used by Calgarycraneandrigging.ca is located in Denmark and run by mono solutions ApS. There are many websites run by this web server. The operator uses this server for many hosting clients. In total there are at least 1,646 websites on this server. The language of these websites is mostly english.